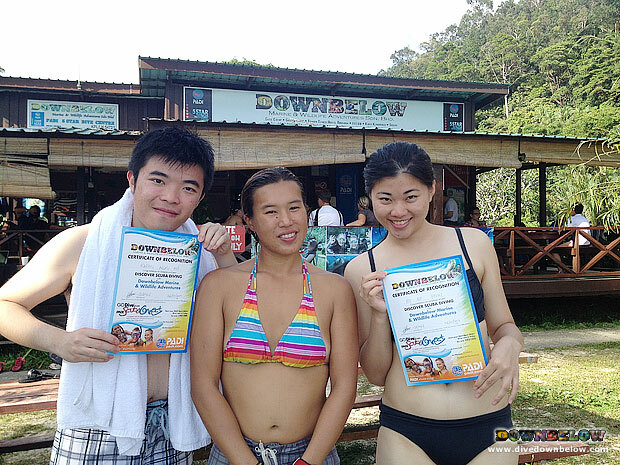 Create amazing holiday memories on the PADI Discover Scuba Diving program! Home/News, Tunku Abdul Rahman Park/Create amazing holiday memories on the PADI Discover Scuba Diving program! PADI Master Scuba Diver Trainer Kaman, introduces her two clients to the beautiful reefs of our Tunku Abdul Rahman Park location! Kaman conducts the PADI Discover Scuba Diving program today, and for her clients’ benefit she conducts it in their first language of Chinese! Scuba diving is a fun activity and like any sport there are rules that must be followed for safety. Kaman’s clients will understand very clearly her instructions and knowing this will relax them to have an amazing day! After a few simple skills in a shallow confined area, Kaman will assess the conditions for a dive as well as her student’s comfort level, and plan her clients’ first open water dive! It’ll be exciting for the new divers finally to witness a turtle or a shark in its natural habitat! Visit us at our Head Office in KK Times Square where one of our friendly and helpful team will assist you to create a memorable Borneo holiday program! By Joanne Swann|2014-02-20T10:27:38+08:00February 20th, 2014|News, Tunku Abdul Rahman Park|Comments Off on Create amazing holiday memories on the PADI Discover Scuba Diving program!